Women working in the nuclear sector may be in the minority, but they were out in force winning all five Advanced Apprentice awards in Design, Maintenance, Manufacturing, Scientific and Support at the 2016 UK Nuclear Skills Awards – held on the 10th March in Manchester. This left no doubt that the overall UK Nuclear Apprentice of the Year, would be female. Grace Draper, from Rolls Royce, UK Nuclear Apprentice and Design Apprentice of the Year 2016. 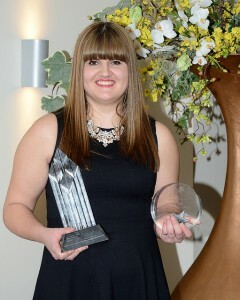 Grace Draper from Rolls Royce, the overall winner, was also awarded Design Apprentice of the Year. Grace completed an Advanced Apprenticeship in Technical Engineering and currently works as a Controls Engineer. This success is made all the more special as reports show that only 10% of the UK’s engineering workforce is female, and only 9% of women in the UK public claim to understand the nuclear industry. The sector has been making significant efforts to address the gender imbalance in the industry through educational programmes such as Energy Foresight and with the establishment of Women in Nuclear (WiN). The success of the female candidates at the Awards is seen as a real positive, clearly demonstrating that the number of women choosing a career in the sector is increasing. “These awards are a fantastic showcase for our industry and I am truly delighted that there was an equal split between male and female finalists and, for the first time, all the winners of the Advanced Apprentice awards were women. I congratulate all the winners and finalists and I am excited about the calibre of the next generation of people working in the nuclear industry”. “The UK Nuclear Skills Awards highlight the exceptional quality of people of all levels, who are committed to careers in the nuclear sector. Other winners on the night include Samantha McRae from AWE who won the Maintenance Apprentice of the Year, Emily Lambert from BAE Systems who won the Manufacturing Apprentice of the Year, Kerry Marie Burns from NNL who won the Scientific Apprentice of the Year and Lucy Green from Doosan Babcock who won the Support Apprentice of the Year. Flying the flag for males the title of Higher Apprentice of the Year was awarded to Stanley Readyhoof from Rolls Royce, The UK Nuclear Graduate of the Year was awarded to Robert Wild from Sellafield Ltd, the Foundation Degree/HND Student of the Year was awarded to Jack Bowman from Sellafield Ltd and the STEM Ambassador Award went to Richard Taffs from NIS Ltd.